The rare warning of disappointing results from Apple stoked investors’ fears that the world’s second-biggest economy is losing steam and that trade tensions between Washington and Beijing are making things worse. 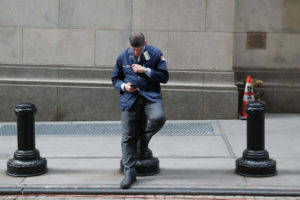 The sell-off also came after a surprisingly weak report on U.S. manufacturing. Apple stock plummeted 10 percent, wiping out more than $74 billion of the company’s market value. Apple stock plummeted 10 percent, wiping out more than $74 billion of the company’s market value. That’s almost as much as Starbucks is worth and more than Lockheed Martin, Lowe’s, Caterpillar, General Electric or Morgan Stanley. Over the past year, the U.S. and China slapped new tariffs on hundreds of billions of dollars’ worth of imports in a trade war that threatens to snarl multinational companies’ supply lines and reduce demand for their products. Companies such as General Motors, Caterpillar and Daimler have all said recently that trade tensions and slower growth in China are damaging their businesses. In a letter to shareholders Wednesday, Apple CEO Tim Cook said that iPhone demand is waning in China and that the company expects revenue of $84 billion for the quarter that just ended. That’s $7 billion less than analysts expected. Cook’s comments echoed the concerns that have pushed investors to flee stocks over the past three months. The U.S. stock market in 2018 posted its worst year in a decade. “This situation is yet another example of how politics — in this case, the trade war — has exacerbated real but manageable economic concerns and turned them into something worse than they have to be,” Brad McMillan, chief investment officer for Commonwealth Financial Network, wrote in a note to clients.